Cardinal Bergoglio on the subway. For many years I have belonged to a Catholic mother’s group online. One of our members was distressed over an article in her local paper saying that Traditionalists in the Catholic Church will be put down by the new Pope Francis because he is more concerned with the poor than with liturgical reform, and that he will undo all the corrections made by the last two popes. Here is my reply that I have extended for the blog. This is actually the second time I’m trying to post this since Blogger lost my post with all my numerous links and additions. I sprinkled the computer with Holy Water so we will give it go. 1st – Don’t believe what is in the secular press. They have agendas and one of those is to smack down traditionalists/conservatives and make them feel powerless. Many secular outlets just print what they want to have happen, thinking if they say it enough it will. Stick to outlets you know are reputable like the National Catholic Register, EWTN, most Catholic Radio like Ave Maria Radio, etc. There are lots of good blogs out there too. Like The Anchoress (my favorite commenter on secular goings on) and many others. Look at my blog list for more great blogs. 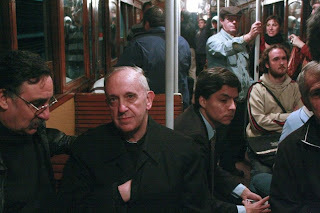 2nd – I think the Pope is authentically Catholic and a good example to everyone. While the “social justice” Catholics are thrilled, I’m sure they are not thrilled at his teachings which are solidly Catholic. He has mentioned evil in the world, he says we should not be afraid to die for our protection of the unborn, he is against the redefinition of marriage, and against “Catholic” pro-abortion politicians taking Communion, etc. with so many quasi-socialist (and not so quasi socialist) leaders in the West, we all may be needing charity soon. many abuses since Vatican II that any little quirk must be smacked down immediately to prevent “liberal” intrusion. Well, all that does is make traditionalists look uncaring about people’s needs and pushes people away. (Why do you think the Dems won this last election? – because Romney looked uncaring toward the 47% or whatever.) Yes, we don’t want x, y or z to happen, BUT we can uphold Catholic teaching and not scream about something minor like whether the Pope washed the feet of a woman. Yes, I know, to some that is not minor, but to 99.9% of the people it is. As someone who had their feet washed by the priest on Holy Thursday several years ago, I found it extraordinarily profound and deeply moving. Now, if the Church says that the symbolism is important and only men should get their feet washed to promote the priestly vocation, that is fine with me, but it seems that the Pope has his reasons for what he did. The blogger I spoke about was commenting on a Facebook post Abby Johnson made on March 27th. She was “talking” to those people who are supporting “gay marriage rights” but who are ignoring the unborn, the ones really with rights. The supposed “conservative” blogger lambasted her for a “pro-gay marriage” stance (which I don’t think she took) and mentioned that she should stop coddling the abortion clinic workers, who probably make less than those at Walmart. How shameful. The clinic workers need compassion and love too, even if they are unlovable – especially if they are unlovable – because they are in the pits of hell and need help to break free. They need LOTS of help. They don’t need people yelling at them telling them they are unworthy. Would you really want to go to God if his followers hate you? Well, that is the impression some traditionalists give in the Church. They take political conservatism and apply it to Christianity and it does not work. “Let ’em pull themselves up by the boot straps,” or “those illegals are going to ruin our country,” only goes so far. Yes, “illegals” are here illegally and something needs to be done, but throwing the lives of their children away solves nothing. It shows to me a hardness of heart. not succumb to liberation theology in his country and was pretty much banished to the hinterlands for not doing so. He soldiered on. Doing what was right and not what was popular. He was not afraid to live a poor life, even though he was a bishop. He took the bus. What we traditionalists need to do is to start getting out there and showing publicly what many of us are doing in private – feeding the hungry, buying diapers and food for the unwed mother, taking communion to the invalids and sitting there talking with them, singing and playing piano to the nursing home residents (I actually have seen that online, praise God,) holding the hands of the AIDS victims, giving legal aid to immigrants. Not to toot our own horns, but to show people what Christianity is and that we ARE helping and doing things for the needy. Our Church has a deep solid foundation of service but we don’t talk about it, so we look uncompassionate and that effects how our teachings are received. The “left” calls us uncompassionate to pregnant women – and the public, including other nominal Catholics, believe them. While humility is good, we should be humble in public at this point. It used to be that communities were tight knit and smaller. Everyone knew everyone. When your neighbor took a casserole to the new mother others knew about it. Not anymore. And unfortunately, many Catholics are not charitable. One woman I know online whose husband has cancer needed help. She was overwhelmed and unfortunately she probably would have gotten more help from the Baptist neighbor than the Catholic one. Most of us know that is true. Catholics have a bad reputation of thinking “the Church” will do it, not us personally. Many of us, of course, are not like that – but many are. We need to show our fellow Catholics that they need to be out there in the trenches too, that is why we need to do things more publicly. And help other Catholics realize even small helps go a long way. Church, we have come a LONG way from just a few years ago and things are really better to teach people what we believe and why. And there are, of course, blogs and online resources that people now turn to first. Will they see compassion and love, or more people worrying about whether the Pope will give abolish communion on the tongue or the Tridentine Mass? You might find papal biographer George Weigel’s article Meeting Pope Francis to be very helpful in seeing that our new Pope is what we really need right now. The cardinals spent a great deal of time discussing what the Church and our world need at the moment. They know Cardinal Bergoglio. They know he was made a Cardinal by Pope John Paul II. They know what he stands for and they elected him quickly. We need to stop being worried, and take his election to be a sign from God that we need to stop arguing and start evangelizing, and taking care of the poor, which are growing by leaps and bounds. Look at the amazing strides Pope Francis did just in the first few days of his election with the Orthodox. This is my humble opinion, for what it is worth. Happy Easter!